We got to go to the Mesquite Rodeo last night with my parents. My dad was gifted free tickets so he took the family. We actually got to sit in a suite and it was really nice. The best part about the whole night is we didn't have to spend any money. :) Gotta love those trips!! We go to the rodeo at least once a year and have done that as long as I can remember. It was sad last night to see so many open seats. People just don't have the love for the rodeo like they used to. We had so much fun watching the cowboys and all of the animals. Bella shares my hatred for tie down roping. It always makes me so sad. We got to watch some young bull riders and that was cool. As a mom it made me cringe but it was neat to see the youngsters participate. There was even a little boy from Forney that rode a bull and he did really good! Today we had church and our A2 group met after church. I love our group. It's so neat getting to know other people in the church and building relationships! It was my turn to hang out with the kids so we set the slip and slide up in the front yard and let the kids go to town. They seemed to have a blast. It was a great weekend. I'm kind of sad it's over, but looking forward to what this week has in store for us. Hopefully lots of fun! This week has been back to reality after vacation last week, this week was back to work for me & Jim and to Gigi & Papa's house during the day for the girls. I've said it before and I will say it again I am beyond blessed that my mom keeps my girls for me. I really don't know what I would do without her. 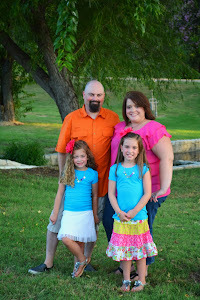 We haven't had a lot of fun time this week so tonight we decided to take the girls to a movie in the park in Rockwall. We went to one a few years ago and thought it would be a lot of fun. They were showing The Odd Life of Timothy Green, which we have all been wanting to see and since this was free and outdoors we thought it would be fun. We got there about 30 minutes before time for the movie to start, put the blanket out, and let the girls run around and play games for a few minutes. Bella found some hula hoops first thing so she was super happy. She also found some Frisbee game to play that looked pretty fun and it was fun watching her play. Jenna stayed closer to mommy and daddy. It got to be time for the movie to start so I grabbed my stash of glow sticks that I bought at Hobby Lobby for $.99!! I got 15 glow sticks for $.99.....that is much, much better than the prices they were selling them for at the movie. :) The movie started and out came the june bugs. I wasn't thinking about the light from our glow sticks attracting the june bugs and Bella, well she was NOT having any part of them hanging out on our blanket. She screamed and cried and whined and I finally gave in and said let's just go home, which started another whining and crying episode from Jenna. I did promise her we would rent the movie at home and I would take her back to another movie in the park. It was still a fun night, just got the fun cut a little short. We are going to the rodeo tomorrow night so I'm looking forward to that. I love getting to spend time with my girls! Bella & the hula hoop - this girl has got some moves!! When Bella started Barn School a few years ago, Ms. Rhonda gave her the nickname "Bella Dancerella." That name was very fitting for her, she loves to dance. Bella started taking dance this past December. She's been in gymnastics for a little over a year and started asking about taking dance also so we decided to give it a try. It was a good move! She has done pretty well so far and I'm looking forward to seeing how she progresses even more. Today was Bella's first dance recital. She was a little bit nervous in the beginning but by the time she took the stage the majority of the jitters went away. Bella's dance teacher Ms. Tina is awesome and she even did a surprise dance at the end of the recital. Both of the girls loved seeing Ms. Tina dance. Bella and her group did such a great job and I am so proud of her. Bella's Gigi and Papa, Li-a, Christa, Mommy, Daddy, sister and Bella's best friend Joseph and his parents were there to cheer her on. It was a fun day and of course here are a few pictures. Tap costume - this was her favorite!! So 2 posts in 1 day!! Today was our traveling day to get back home. Vacation was nice but like Dorothy says "There's no place like home!" My parents have become friends with one of our State Representatives. My mom called him to see about helping us get a tour of the Capitol and he totally came through! He wasn't there today but some of the guys in his office got it set up for us. When we got there we found out we were getting a private tour which was super cool! We got to see the old vault, learned about the secret of the star, went all around the Capitol and learned some history as well as some fun facts. We got to see where all of the voting takes place, the girls found Mr. Gooden's picture on the wall and got their pictures taken near his. We were going to get to get the girls' pictures taken at Governor Perry's desk where he signs all of the laws that pass but there was a meeting going on......we found out later he was passing the new law regarding saying "Merry Christmas" in school. We were literally on the other side of the door. We got the girls' picture in front of the door so that is neat to know now what he was doing while we were standing there. It was definitely worth the stop. It was such a neat experience. The girls learned quite a bit today and they were very interested in all that they saw and learned. We also stopped at the Czech bakery and got a kolache.....totally not on my diet but I'm not gonna lie IT WAS GOOD! We are now back home doing our normal every day routine. Tomorrow is back to reality for me, I have to go back to work. We had such a fun week and I am so thankful for the time I got to spend with Jim and the girls this week. I love creating memories and we created some amazing ones this week! This is in the old vault. It's just a storage now. You can't see it in the picture but the light bulbs actually spell out Texas - pretty cool!! I left my camera in the car last night and it was pouring down rain so my post about our last fun day of vacation had to wait. Yesterday morning we headed out to Sea World to spend our last "fun" day on vacation. It was super hot but so much fun. We were on a pretty tight budget for vacation this year but we were still able to have lots of fun. We packed lunches yesterday so that we wouldn't have to spend a ton of money at the park and actually other than parking we only spent $8.64 in the park at Sea World and I call that a SUCCESS! It was the best $8.64 I've ever spent and it was on a couple of Icee's to help us cool off. When we got to Sea World we headed over to see the dolphins. We weren't able to feed them this time but we did get splashed by them once and got to see them swimming around their tank. That was really cool. We were hoping to get to pet one but they didn't come up where we could pet them. After the dolphins we headed over to watch the show Azul. If you are going to Sea World San Antonio you HAVE to see the show Azul. It is absolutely AMAZING. We saw it when we were there a couple of years ago and knew we had to see it again this time. We had to sit in the "Splash Zone" of course but luckily the only thing that really gets you wet at this show is the crazy man that walks around before the show starts. After Azul we headed to lunch at the car and to get some air conditioning for a few minutes then headed to the HUGE splash pad in the kids area. They have a Sesame Street theme in the kids are and it is lots of fun over there. I'm pretty sure our girls could have spent all day there and been absolutely fine. After the splash pad we headed to see Shamu. Now Bella and Jim wanted to sit on the 1st row but I was not about to do that. I've been to Sea World a few times so I know better. Jim & Bella remembered getting splashed last time and wanted to get super splashed this time so we compromised and sat mid-ways down in the splash zone. I knew we were going to get wet but I didn't think we were going to get DRENCHED. The guy came over just as Shamu was getting ready to splash and told all of the kids to come down in the aisles if they wanted to get really wet so my girls ran down there. Let me just say that the water was like something that came out of the arctic when it hit.....it was literally breath taking. I got soaked and my husband well the left side of his shirt got wet and that was about it. How did that happen????? LOL! The girls thought it was hilarious. I love Shamu so it was okay. We had a lot of fun on our last day. The smiles on the girls faces were priceless and we have a lot of great memories from Sea World and I'm sure we will be heading back before too long.